You should always consult a Licensed Behaviorist first for temperament and training issues. 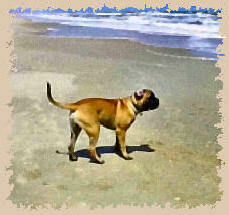 Only a Licensed Behaviorist will be able to properly diagnose and treat your Bullmastiff. A social Bullmastiff is a safe Bullmastiff. Harry is able to enjoy runs on the beaches because he is such a social butterfly. Would you be able to do that with your Bullmastiff? This picture was contributed by his breeders Phil and Karen Burke of Beloved Toad Bullmastiffs.